Going organic: Are organic pesticides safer than their synthetic counterparts? Manitoba government to cancel/change its ban on pesticides used on lawns and gardens! 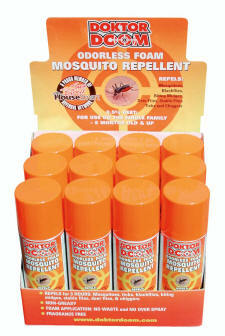 Above, Doktor Doom House & Garden Insecticide Spray. 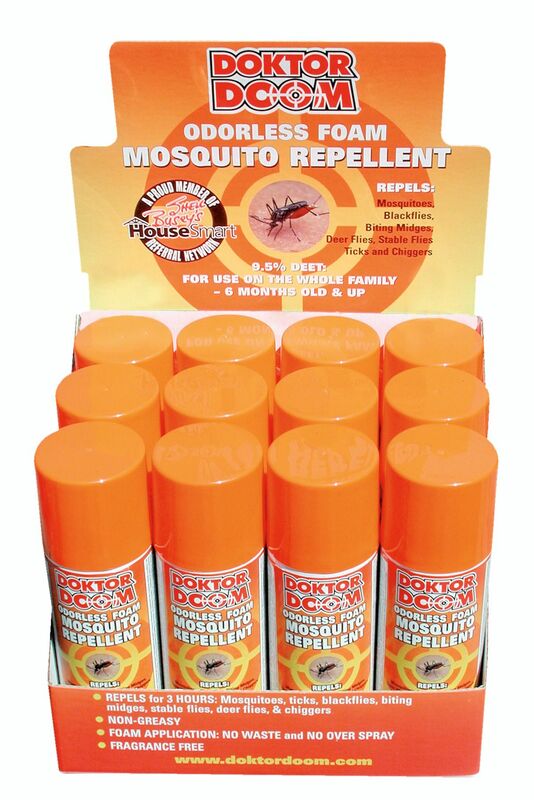 Below, Doktor Doom Mosquito Spray. Author Photos. On Global Television's First National news report of Thursday, July 16, a way back in 1998, Sean O'Shay did a piece supposedly on the need to use fewer chemicals in our gardens. It started out by showing a commercial chemical applicator spraying a lawn, and the operator telling us that he was using Dursban. Then we were shown close-ups of garden pesticide labels that left out the specific manufacturers, but included the poison labels. The inference, for me at least, was that they were trying to make it look as if the chemicals sold in garden centres are more poisonous than those applied by the commercial applicators. In fact, the Dursban named by the commercial applicator is the same product as Chlorpyrifos that used to be sold in garden centres. Chlorpyrifos, made by Dow Chemical, is a useful product for many insects including ants. But I wouldn't want to be party to any suggestion that a commercial applicator can put it on any more safely than the average homeowner who reads and follows the directions on the label. Then came the suggestion that there were many ways of attacking plant pests without the use of chemicals. Once again, the tiring old idea that if it's organic, it must be good. It brought to mind the suggestion that a national garden writer made several years ago, and which I mentioned in one of my Canada's Weather Network lawn & garden reports that was running then. The idea is for smokers to collect cigarette butts in a small glass jar, add some water, and "let them steep." In fact, what you are "brewing" by doing this is Nicotine sulphate--a so-called natural product that used to be sold on the domestic market as an insecticide. It was removed from the market simply because it is quite deadly! And, that "brewed" by home gardeners thinking they're doing themselves and the planet a favour, is quite likely even more deadly. Certainly such home-made products are far more deadly than any of the chemical products on garden centre shelves today. Finally, Global brought us the old beer trap method of slug control in the garden. There was film footage of a small white plastic dish being filled with beer and we were told that it would attract the slugs and they were then easy to get rid of. Well, may I add one small point, which must be done if this method is to work? The container with the beer must be buried in the ground so its top rim is even with the soil surface. And, it's best to put a lid on it (Global TV did not), and cut a 3 cm diameter hole in the centre of the lid. That way, the slugs smell the beer, crawl to the smell, and fall in the hole, and remain trapped. But they will not climb up a steep, sloping dish to reach the suds! Many weeks back, a caller to my then TALK 640 radio show in Toronto asked me the question, "how does a new gardener know what's right and what's wrong of the things we see and hear that we should be doing?" I wish I knew the answer to that question! It seems to me, the more information there is out there, the greater the percentage of it that is either incorrect, or not entirely correct. Obviously, novice gardeners ought to pay attention to the original source of the information they are considering. Often today, and I guess it's not just in gardening and horticulture, people (often newly interested in a topic) hear, read or see something, and repeat it in another medium, but put an emphasis on one aspect. I well recall this happening a few years ago. An organic gardener thought she had read somewhere that Dormant Spray worked better in the spring if the two ingredients in it (lime sulphur and fine oil) were applied separately. She stated this on a large-audience radio gardening programme, and the host did not question it. Suddenly, thousands of people were telling friends and acquaintances of this important new piece of information. But, on searching back, no one could find any research to back up the statement. It is simply not correct. Lime sulphur and oil spray are not only effective in their own rights but have a synergistic relationship when applied together, as in all accompanying instructions! Be on your guard, and stay with me as my fellow curmudgeons and I keep eyes and ears open for offending erroneous, incorrect information! Alternate insect control, or natural insect control, has long been a topic of interest to some gardeners. If you listen to a vocal minority of gardeners--those wanting to control insects, diseases and even weeds using only natural methods--the number of gardeners employing these methods is increasing exponentially. It isn't! Both the manufacturers of the chemicals, and the garden centres/home improvement centres that sell them will verify that sales of the chemical products have NOT declined, but continue to grow, and the sales of the so-called natural products, while increasing, is not increasing substantially in comparison with the chemical products. I'm sure there are many gardeners out there who would like not to have to use chemicals. But many of them have tried the so-called natural methods and found them to be only modestly effective at best. For almost the last two decades there have been insecticidal soap products available. The first such product was developed by Dr. George Puritch at the Pacific Forest Research Centre, near Victoria, British Columbia in the late 70s. Actually, insecticidal soaps for controlling pests have been known for some time but the petrochemical products introduced in the late 1930s overshadowed them. Dr. Puritch and an old friend Sergei Condrashoff, first president of the Safer Agro-Chem company, told me how, while studying hormonal activity in the balsam woolly aphid in 1973, George more or less stumbled on the fact that fatty acids (soaps) could kill the insects. That lead to further experimentation with varying combinations of fatty acids. His research within a few years showed that insecticidal soaps, WHEN SPRAYED RIGHT ON INSECTS, penetrate their bodies causing destruction and disruption of their membranes--usually resulting in death. As well, the insecticidal soaps accumulate in the nervous system and cause paralysis. What he also discovered was that many of the insects that are not killed outright are affected in such a way that they never reach maturity, thus never have the chance to reproduce. By early 1980, Dr. Puritch's research had indicated that insecticidal soaps were effective in the control of aphids, earwigs, mealybugs, mites and white flies, as well as several disease organisms. At that time, nematodes, spittlebugs, gypsy moth, and pear psylla also showed indications of being susceptible to certain fatty acid salts (soaps). But, that most important factor remained, and still remains the critical point--the spray must actually wet the insects. And, the fact is that once the insecticidal spray dries, it is no longer effective. Don't disregard insecticidal soaps. They have been improved since my old friend Sergei talked on my radio programmes of the early 1980s, about this new (less harmful) method of insect control. At least one additive is found in some products which causes the spray to remain moist for a longer period of time. And don't forget my suggestion of spraying the subject plant with water first, so the atmosphere in which it is growing is damp. That will mean the insecticidal soap will remain "active" for a longer period of time. But also keep in mind the use of chemicals should still be in most gardeners' arsenals in the battle to control insects and diseases. If the poisonous petrochemical base (found in most insecticides) concerns you (as it should), then consider some of the newer chemicals such as the water-based Permethrin. It bears no poison label and is widely available, particularly at well-stocked garden centres (check for the Doktor Doom brand).. The natural pesticide Nicotine sulphate was taken off the market years ago because it was too dangerous! All of this came to mind as I noted this week that a major supermarket chain now has its ladybird beetles in stock. Some garden centres are also offering them for sale. They come from Natural Insect Control at R.R. #2 Stevensville, Ontario L0S 1S0. Telephone 905-382-2904 for their free catalogue of other non-toxic insect controls including purple martin and bat houses. The beneficial live ladybugs come in small burlap pouches of about 1,000 and cost between $5 and $6. Finally, a word about where we seem to be heading in pest control. The aforementioned water-based Permethrin is just the forerunner of new products on their way. There is already one formulation of Diazinon available where the chemical is encapsulated and only attacks the target insects (cockroaches). It is safe enough to paint on kitchen countertops, and may even be consumed by humans without any effect. The product is expensive, but does work well. Less-expensive water-based Diazinon products and similar formulations of other insecticides will likely be with us in just the next few years.